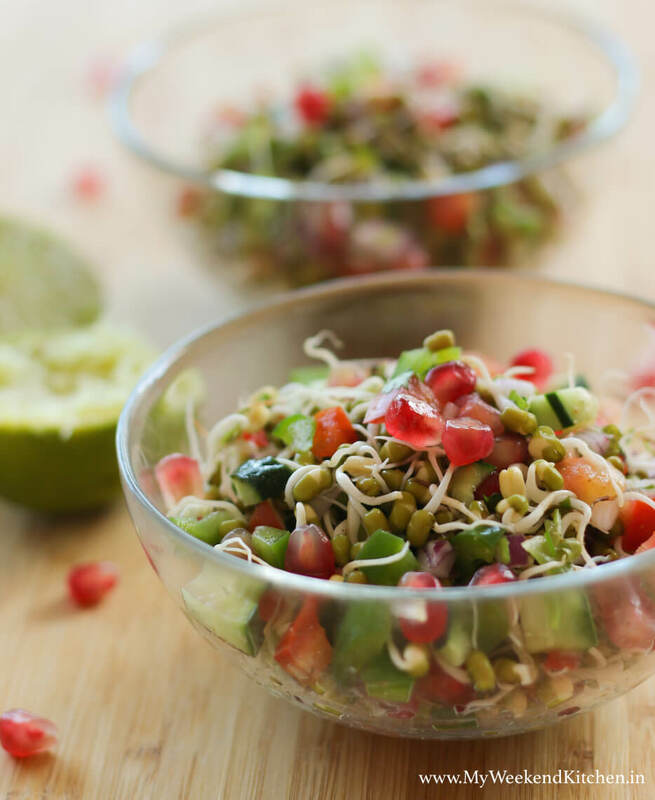 Soft, crunchy, juicy, spicy, tangy; this moong dal sprouts salad is a potpourri of flavors and textures. 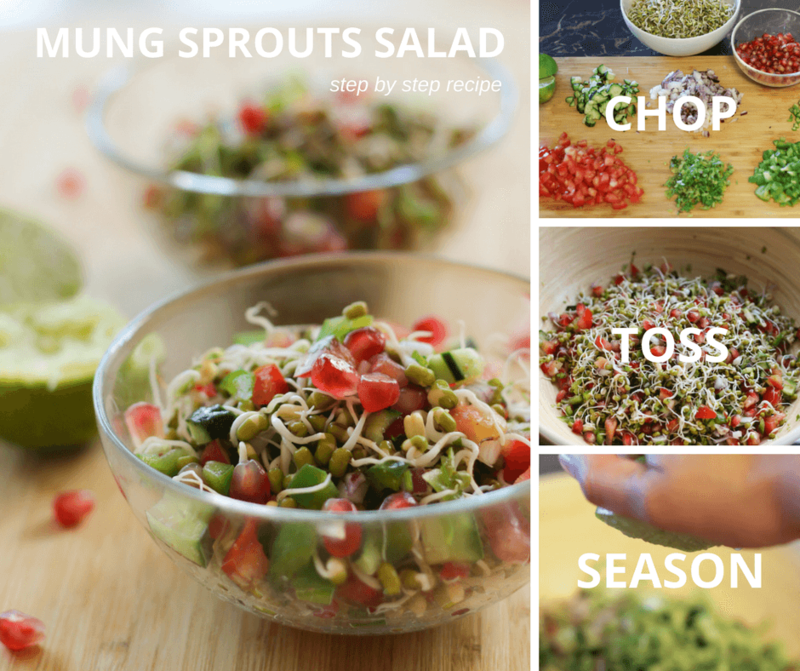 I just toss together a variety of fresh seasonal vegetables with mung dal sprouts, little lime juice, and some light Indian seasoning and voila! the sprouts salad is ready. It is quick. From start to serve, it is ready in 15 minutes. 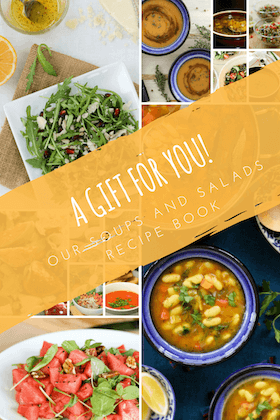 a great addition to your meal or the complete meal itself! Sprouting moong dals at home has been a common practice at my home and very often I add sprouts to salads and chaats. 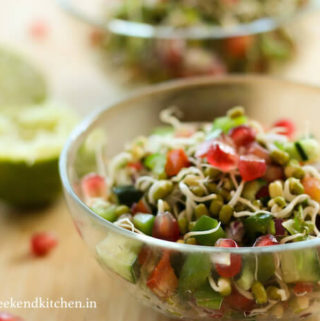 Yesterday morning, when I went to the kitchen to make Sikander’s lunch salad; I opened the tea towel in which I had put mung beans for sprouting 2 nights before and they had all become such plump beauties with long tails that I decided to make this Indian chatpata sprouts salad. Peppery and tangy at the same time :-). This sprouted moong dal salad is a flag bearer of health-meets-taste. Normally street food in India won’t be classified as healthy, but now-a-days many roadside chaat waalas in India have moved to, or at least added sprouts salads and sprouts bhel in their menu. You can also add sprouts in the filling of usual snacks like samosas or bread rolls to make them healthier. Whole green mung daal sprouts are the most common sprouts in India. They are one of the best protein sources for vegetarians. In fact, all bean sprouts are more healthy than dry beans. Sprouting results in a lot of nutritional improvement — higher proteins, fiber, amino acids, essential fatty acids, vitamins, and minerals. Raw or cooked, it is a great idea to include them in your diet, especially if you are vegetarian and looking for plant-based protein sources. Soft, crunchy, juicy, spicy, tangy; this moong dal sprouts salad is a potpourri of flavours and textures. I just toss together a variety of fresh seasonal vegetables with mung dal sprouts, little lime juice and some light Indian seasoning and voila! the sprouts salad is ready. Chop all the veggies into tiny and almost similar size. In a big bowl, toss together the chopped veggies, half of the pomegranate seeds and sprouted moong beans. Season with lime juice, cumin powder, salt, pepper, dry mango powder and fresh coriander. Mix well. *The pomegranate seeds add a shining red color to the salad but, they also give amazing juiciness to every bite of the salad and not to forget, their amazing health benefits. **Since I sprout my beans at home, I safely use them in raw food recipes. But if you are not sure of the source, it may be better to steam or boil the sprouts, therefore removing any impurities. Click here for how to sprout seeds and beans at home. Hi there, I found your blog on google while searching for a related topic, your web site came up, it looks great. I’ve bookmarked it in my bookmarks.